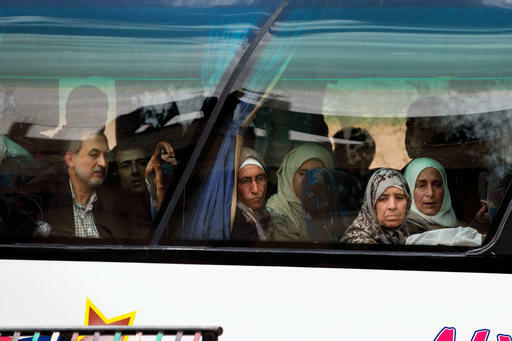 PALMYRA, Syria (AP) — When Islamic State fighters overran the ancient Syrian town of Palmyra almost a year ago, Maha Abderrazak was among tens of thousands of terrified civilians who fled west, many escaping with just the clothes on their backs and a few belongings they could carry by hand. This week, the 22-year-old is among the few hundred town residents trickling back to Palmyra — now free of IS extremists — to check on their homes. They came to salvage what they can — some carpets, blankets, a fridge or a few family mementos. There is no water or electricity in the town, and it will be at least few months before anyone can return to stay. The emotional scenes of people hurriedly carting away belongings highlights Palmyra’s present-day human tragedy that has been largely sidelined by the magnitude of the destruction inflicted by IS militants on the world famous Roman-era ruins that stand just outside the town. Much of the ancient Palmyra, a UNESCO world heritage site that includes 2,000-year-old ruins, was destroyed by Islamic State militants who blew up some of its most famous monuments, filming the destruction for the world to see. The destruction of the Arch de Triumph, temples of Baalshamin and parts of the Temple of Bel, one of the best-preserved Roman-era sites, captured world attention and triggered an outpouring of international concern. “I understand it, the ruins are stunning,” said Abderrazak, with a timid smile. 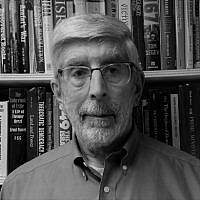 But some of her neighbors were less forgiving, saying their suffering has been ignored by a world fixated on ruins and stones. 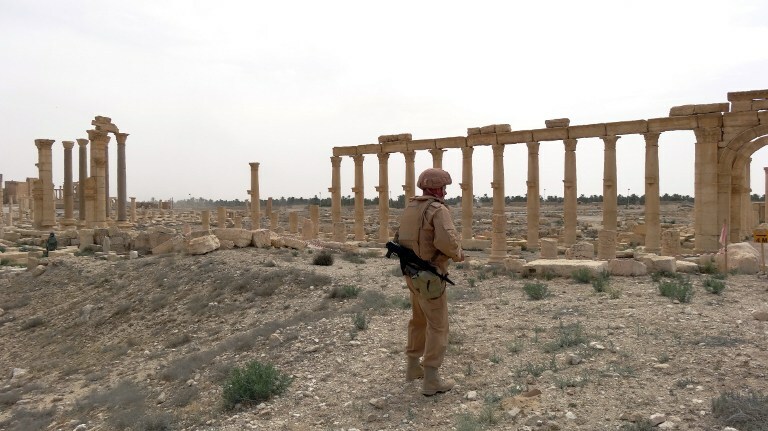 Palmyra, a desert oasis surrounded by palm trees, was retaken by Syrian government troops backed by allied militiamen and Russian airstrikes in late March. 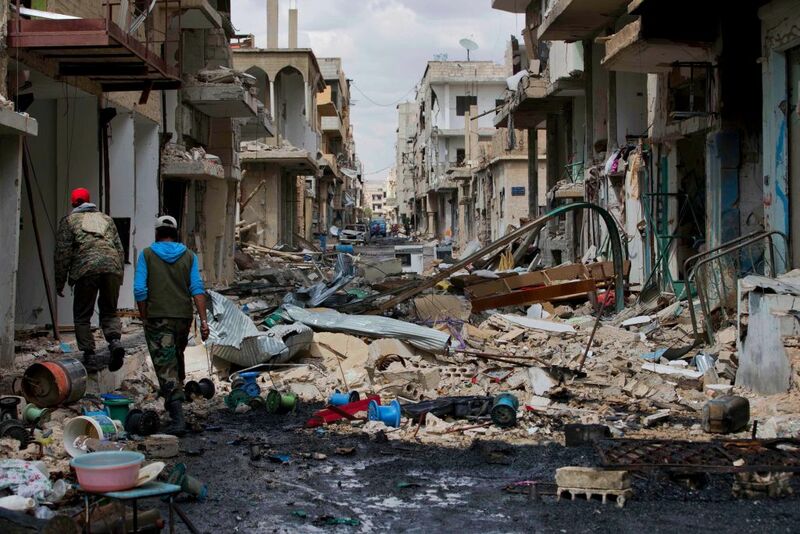 The offensive routed IS militants who had controlled the town for 10 months, imposing their strict interpretation of Islamic law or Sharia and carrying out public beheadings, including that of the antiquities chief whose body they hung from a pole in a main square. As they retreated, IS militants left behind thousands of land mines, both in the town and inside the archaeological site. Access to the ruins is currently barred as a Russian military team continues to clear the site of mines. Regular detonations can be heard around the town as they work. Near the entrance to the ruins and the Palmyra museum, the streets are plundered with large holes created by controlled IED explosions. On Thursday, experts were documenting the damage inside the Palmyra museum, taking some of the pieces away in trucks for safekeeping, before they can be restored. The scene on the town’s Wadi Street was very different. 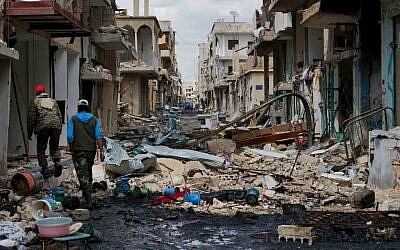 Residents who came in cars and government buses from the central city of Homs, about 160 kilometers (100 miles) away, had only few hours to check on their homes and quickly assess what they could take away with them. They hurriedly ferried out teapots, cups, electric fans and photo albums, placing them on the pavement next to suitcases of all sizes, to be loaded onto the buses. Baby prams and bicycles — used by residents to help carry belongings to the buses — were left on the street, discarded amid debris and glass shards from shop windows that had been blown up, presumably by blast waves from airstrikes and bombs. 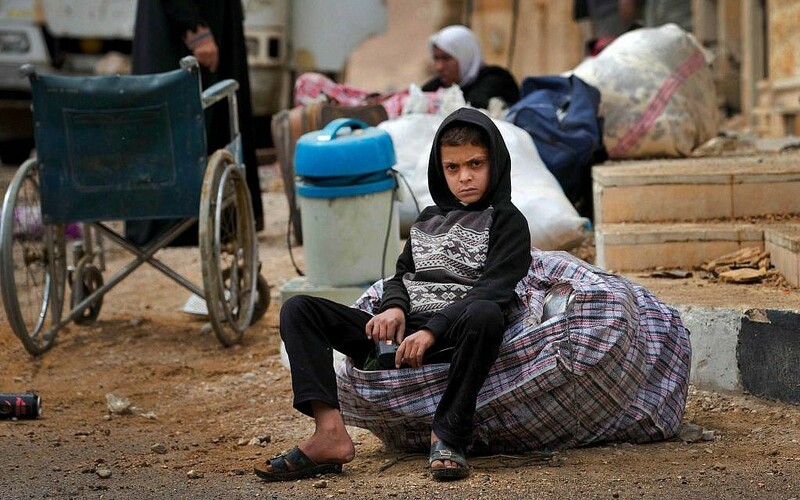 The scene has become all too familiar in Syria’s civil war, now in its sixth year: people coming back home from wherever they were temporarily displaced, only to find their neighborhood an uninhabitable wasteland and their homes in ruins. 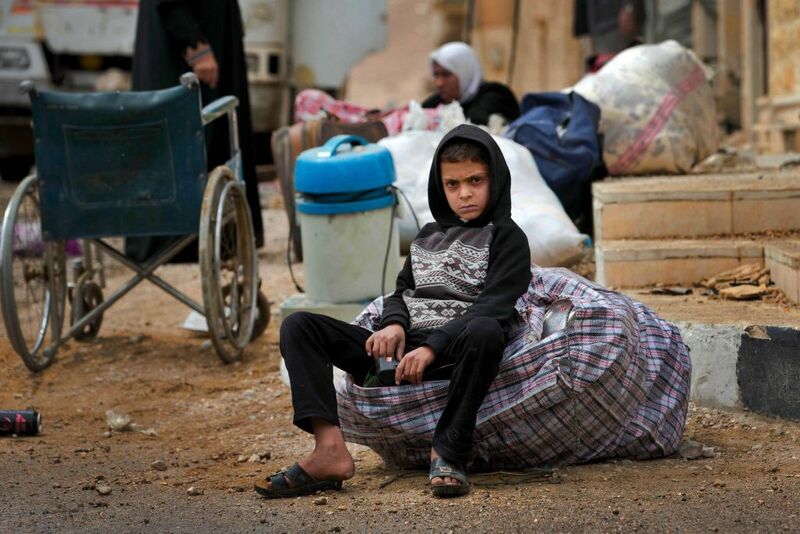 Hassan Ali said up to 100,000 people lived in the town before the war. When IS arrived, the people of Palmyra just “melted into the earth,” he told The Associated Press. 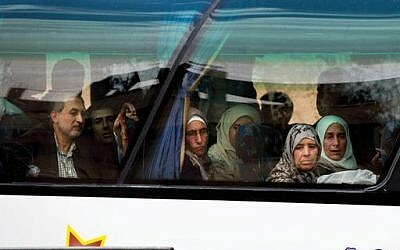 Most fled with just their clothes on, he said, sitting with his wife Asmaa, waiting for the bus to take them back to Homs where they now rent an apartment. 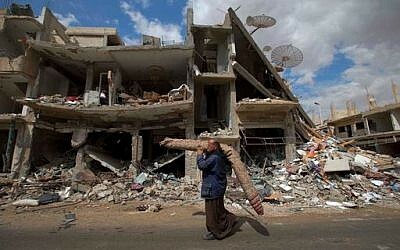 “We have no furniture in Homs, we came to take a few things until we can come back,” he said. His wife said she took photos of their 8-year-old daughter when she was a baby. 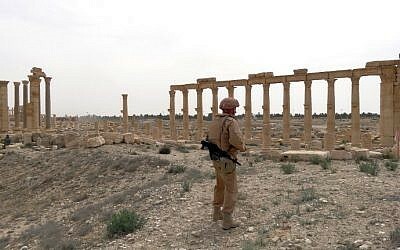 For Nasser Ahmad, 40, it was the second time this week to comeback to Palmyra. He came with his wife and two children, Ghazal and Hatem, aged 4 and 2 years. Their apartment in a four-story building is largely intact, and he’s been taking out belongings in batches, including a gas oven to use in Homs. Renting a place in Homs costs about 20,000 Syrian pounds (around $40 dollars), which is exactly what he makes as an agriculture employee, he said. He also wants to show his children their home as often as possible, so they don’t forget it. Ghazal, his daughter, sat on his lap, barefooted and clutching a coin container or “matmoura” — the Syrian equivalent to a piggy bank — she had salvaged from her room. The family watched the bright pink and green buses get ready to leave, mattresses, pillows and carpets piled high on top. Soad Daher, 63, said she was grateful for the Russians for helping the Syrian army regain Palmyra. She also recounted how some townspeople hid Syrian soldiers in their homes, sometimes giving them women’s all-encompassing flowing robes known as abayas, even bras, to wear. Abderrazak, 22, told how in the first days after Palmyra fell to IS, she and her older sister were twice turned back by the militants at a checkpoint because they didn’t have a male chaperone and were not covered. On the third try, they were allowed to leave only because their uncle came with them and only after they paid the IS guards money. Overwhelmed by tears, she said it’s an “indescribable feeling” to see her family home still standing. From her neighborhood, Palmyra’s majestic hilltop citadel is clearly visible. It has been heavily damaged by the fighting, with one side partially collapsed and showing signs of mortar or dynamite explosion. “Palmyra was a paradise, truly,” she said, choking on the last word.